WeerNProduction was officially founded in the fall of 2011. After just a few years and a lot of hard but rewarding work, "Weer" has several productions under their belts. The Long Drive Home was their first shot at producing and will always be their "baby". "It was the special script and sensitive material of William Tyler's script that caught their attention. It was just something we felt we needed to produce and a story that we needed to share. It was truly a passion-project." The Long Drive Home has since gone on to win multiple festival awards. In that amount of time they have been fortunate to produce several awesome projects including features,The Posthuman Project and LA based film, Death Factory and several award-winning short films. 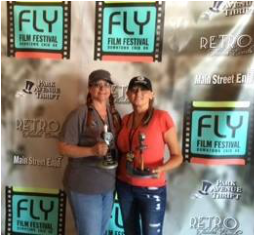 Sha'ree and Wendy continue to assist with projects they find themselves close to, as well as, working commercials or large projects that come in so that they can fund their true passion for working on "indie" films. Check out our Kudos tab to see our festival wins and films in distribution. Please help yourself around the website and drop us a line from the contact tab should you have any questions or need any of our services. Thanks for dropping by. WeerNProduction is an Oklahoma based company but will work local wherever indie film opportunities arise. We also have extensive experience with filing for SAG projects and following through with all related paperwork and guidelines, as well as, experience with Oklahoma Film Rebate as we have completed that process before and are currently approved and in the queue for the feature, "Secret Dreams".